Totally. And may I point out that Satan is not using Katy Perry to lure children his way, in spite of the exclamations in an article that found its way onto my Facebook newsfeed. When people pray, they don’t realize it, but they are doing what they rarely otherwise do, which is to clear their minds, turn off their electronic devices, and use their imaginations with confidence that they will find the answer. Clearly the answer is from their own intellects, but they are conditioned to believe otherwise. Like Kate, I wish we’d take full responsibility for our own decisions and actions. Until then, crazy people will claim God told them to do all sorts of stupid and despicable things. Excellent post, Kate! Taking credit away from the good deeds of people renders them powerless. That’s the last way we should be feeling these days. I’d be curious to know if the most secularized countries (I know, tough to define) are also the most aggressive in instituting social safety nets. In other words, if secularism equates with government action to solve issues of poverty, climate change etc. Also, every time I read about instances of individuals thanking god for their good fortune, I can’t help wondering why they don’t connect the obvious dots. Isn’t god then responsible for all the innocent people whom bad fortune befalls, all the kids who don’t have a Nadia Lopez or worse die from malnutrition or disease? “. . . [S]ociopolitical development is largely a cognitive process focused on conditions in the material world. However, even a cursory examination of African American social change movements reveals that the inspiration, strategy, and courage for this struggle relied heavily on religious and spiritual belief (Brookins, in press)… At the psychological level, spirituality is also a bulwark against pessimism and disillusionment when the rational mind would conclude the cause is hopeless. I’m not sure I agree, but I do think it’s worth thinking about. In particular, the idea of spirituality as a positive bulwark against hopelessness–and one that is culturally important as a strategy for empowerment–answers the question of maybe why Ms. Lopez credited God the way she did even in the face of evidence to the contrary. 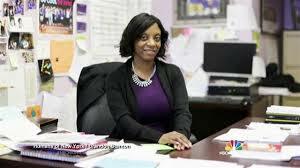 Her own belief may in fact have played a role in her ability to keep going as a principal long enough for all of this to happen, even if that’s not exactly how she sees it. I have to add my two cents to Cokey’s post above. The belief in a higher power helps people because it is a paradigm that serves the general purpose of providing hope. We can derive hope from faith in something else like our selves, our community, our family, friends, and rely on rational problem solving behavior. Religion and God are just the default for the average person and this is not going to change too quickly. But it’s changing as our society is becoming secularized and we are using knowledge rather than superstition more to guide our actions and attitudes. People are indoctrinated in religion, so their view of life and events derives from that mythology. But you don’t need religion to get the same benefits religion now creates for the believers. I hope they eventually figure that out. I do think that the idea of God inspires some people–I even said that about Lopez–and religion has obviously been a force for good in liberation struggles throughout the world. And of course, the idea of an afterlife can help people endure the sufferings in this life. (Opiate of the masses, and who doesn’t appreciate a good opiate?) But it seems to me this can be a negative as well. When I was writing this piece I was thinking about all those countries with excellent social safety nets (Finland, the Netherlands, Sweden etc.) also being extremely secular. I thought maybe instead of relying on God, they knew they had to make their societies right themselves. But maybe it’s the opposite: maybe once you don’t have to fear hunger and poverty and neglect–once THIS life is reasonably free from suffering–you don’t need religion any more . . .
Kate, you are going to love my book. I it all about this and more. It will be published soon on Kindle under the pen name Joseph D. Nehemiah and titled Cosmic Casino. I’ll let you know when it is available. If you like it, please tell your readers about it. They are all clearly people who will enjoy it.